Bajorans have investigated Cardassian activities before, during and after the 30-year occupation. In 2371, Odo contacted an old Cardassian acquaintance to investigate the Obsidian Order. Plays on any Cardassian mission (for free if you have a Resistance personnel there). Your Bajoran personnel may now attempt this mission. Discard after mission completed. Requires: affiliation, Resistance, Bajoran species. 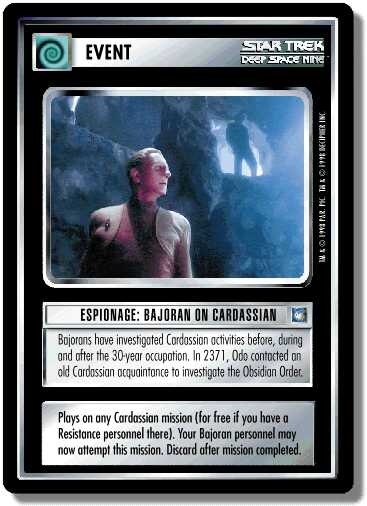 There are 15 entries for Espionage: Bajoran on Cardassian (ST1E 5 U 61) at the Tradeplace (24 haves and 5 wants). Click here to see all trade list entries for this Uncommon card!